Serum Free Media Market : Segmented Based on Media Type - protein expression media, stem cell media, hybridoma media, primary cell media, insect cell media, immunology media, Chinese hamster cell (CHO) culture media and chemically defined media ; By end users - biopharmaceutical companies, clinical research organizations and academic research centers. The global Serum-Free Media market is expected to expand at a CAGR of 7.3% over the forecast period 2018–2026. 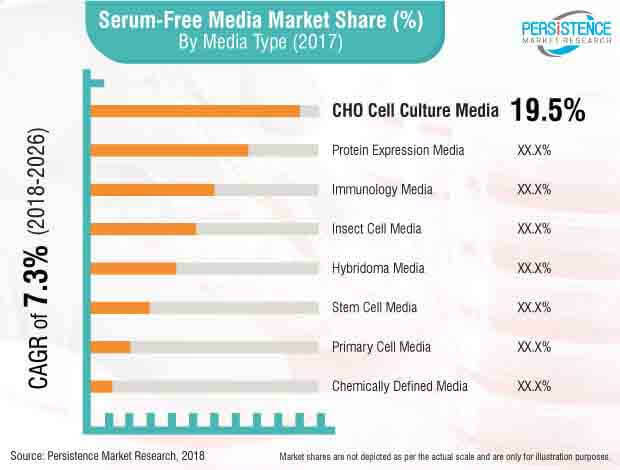 By media type the global Serum-Free Media market is expected to be dominated by CHO cell culture media with 19.6% market share in 2018 followed by protein expression media. The global serum-free media market is segmented on the basis of media type, end user and region. The global serum-free media market is segmented on the basis of media type as protein expression media, stem cell media, hybridoma media, primary cell media, insect cell media, immunology media, Chinese hamster cell (CHO) culture media and chemically defined media. The serum-free media market is driven by the increasing production of biopharmaceuticals due to increasing number of biologics used for treatment of different disease. Serum-free media offers superior cell culture growth as compared to serum containing media. Serum contains unidentified components which may hamper the final output qualitatively or quantitatively and to prevent that various biopharmaceutical companies are preferring serum-free media for the cell culture. Downstream process is regarded as the bottle neck of biopharmaceutical production and serum-free media helps to minimize the complexity of downstream process which further enhances adoption of serum-free media for biopharmaceutical production. By media type serum-free media market is dominated by CHO cell culture media due to higher adoption by biopharmaceutical companies for the cell culture growth. CHO cells are most widely used for industrial production of recombinant therapeutics in the mammalian hosts hence dominating the serum-free media by market values share. Chinese hamster ovary cell culture is widely used for the commercial production of therapeutic proteins. Protein expression serum-free media is second most lucrative segment by media type due to it’s higher adoption for the recombinant protein production which allows analysis of gene regulation, protein structure and function analysis. Stem cell media is the fastest growing segment in the serum-free media market due to rapidly increasing usage of stem-cells in different therapies. Stem cell media in serum-free media market is expected to expand with the CAGR of 7.9% over the forecast period attributing to vast research going on around use of stem cells. Increasing production of antibodies for therapeutic use expected to enhance use of hybridoma media further enhancing serum-free media market growth. As the monoclonal antibodies can be used for the prevention, diagnosis and treatment of different diseases hybridoma media serves as the effective way for their commercial production enhancing serum-free media market growth. Primary cells have finite lifespan in cell culture and hence after certain period of time they die. To use primary cell in serum-free media for cell culture growth it requires addition of cytokines and growth factors to optimum level. Whereas primary cell culture often remains physiologically and therapeutically unaltered which enhances adoption of primary cell culture in serum-free media market. Insect cell media in serum-free media market is another media type which is used for the production of viral pesticides, recombinant proteins and vaccines. Insect cell media in serum-free media have over 100 species which offers diverse and effective mean for cell culture growth. Immunology media in serum-free media is used to culture immune cells which play important role in immune therapy in managing diseases such as cancer and infectious disease. Immune cell culture media is third most lucrative and one of the fastest growing segment by media type in the serum-free media market. Chemically defined media in serum-free media is least lucrative segment by media type. Exclusion of serum from cell culture reduces the quantity of unknown components near to null and hence chemically defined serum-free media is least preferred.